Burr, Nelson, United States Senator James Dixon: 1814-1873, Episcopalian Anti-Slavery Statesman., (History Magazine of the Protestant Episcopal Church 50, March 1981: 29-72). Burr, Abraham, Western Star Over Connecticut, (Canton Lithograhpics,1984). Croffutt, W.A., and John M. Morris, The Military and Civil History of Connecticut During the War of 1861-65, (L. Bill, 1868). Deming, Henry, Eulogy of Abraham Lincoln, (A. N. Clark & Scribner's Sons, 1924). Blaker, John, A sermon on the services and death of Abraham Lincoln, preached in Christ church, Bridgeport, Conn., Easter Sunday, April 16th, 1865. Repeated in the North Congregational church, Bridgeport, April 19th, 1865. Campbell, W.H.W., Memorial Sketch of Lafayette S. Foster, LL. D., United States Senator from Connecticut, and Acting Vice-President of the United States, (Franklin Press; Rand, Avery, & Co., 1881). Eggleston, Percy, Lincoln in New England, (Steward, Warren & Co., 1922). Lane, Jarlath, A Political History of Connecticut During the Civil War, (Catholic Univeristy of America Press 1941). McSeveney, Samuel, Re-electing Lincoln: The Union Party Campaign and the Military Vote in Connecticut, (Civil War History, June 1986). West, Richard, Gideon Welles: Lincoln's Navy Department, (Bobbs-Merrill, 1943). On September 11, 1848, Congressman Abraham Lincoln probably landed at Norwich, Connecticut after taking a steam ship from New York City. He was destined for Massachusetts to help rally that state’s Whigs behind the presidential candidacy of Zachary Taylor. He gave no known speeches in Connecticut, taking the railroad north to Worcester, where Bay State Whigs were holding a convention. It was Mr. Lincoln’s first visit to Connecticut, and he would not return for more than 11 years. In late February 1860, Mr. Lincoln came to New York City to give what became known as his Cooper Union Address. Connecticut Republican State Chairman Nehemiah Sperry sent an agent to Mr. Lincoln to seek his agreement in making speeches in Connecticut that might help Republicans in their upcoming gubernatorial election. Another message came from O. R. Post with an invitation from the Republican Club of Hartford to speak in the state capital. It was agreed that Mr. Lincoln would speak in Hartford on March 2 after he visited his son Robert in Exeter, New Hampshire, but Mr. Lincoln received so many requests for speaking engagements in the Granite State that his address in Hartford was postponed until March 5. 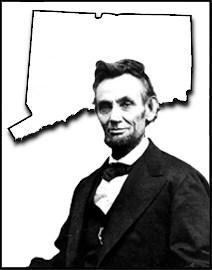 Other Connecticut invitations for Mr. Lincoln came in as well – for New Haven and Meriden. Now we hear no more of this; and the question arises, ‘Why can’t this question which we all desire so much to be settled, be satisfactorily arranged?’ The reason is, that while we all agree that we want it settled, one faction wants to settle it one way, a second has a different plan, and a third still another. Each pulls in a different direction. All desire its settlement, but differ in the method of doing it; and none of them being in a decided majority have ever been able to accomplish the object. I think one great mistake is made by them all. I think our wisest men have made this mistake. They undertake its importance, and a settlement can never be effected until its magnitude is properly estimated. Now what is the difficulty? One-sixth of the population of the United States is slave. One man of every six, one woman of every six, one child of every six, is a slave. Those who own them look upon them as property, and nothing else. They contemplate them as property, and speak of them as such. The slaves have the same ‘property quality,’ in the minds of their owners, as any other property. The entire value of the slave population of the United States, is, at a moderate estimate, not less than $2,000,000,000. This amount of property has a vast influence upon the minds of those who own it. The same amount of property owned by Northern men has the same influence upon their minds. In this we do not assume that we are better than the people of the South – neither do we admit that they are better than we. We are not better, barring circumstances, than they. Public opinion is formed relative to a property basis. Therefore, the slaveholders battle any policy which depreciates their slaves as property. What increases the value of this property, they favor. When you tell them that slavery is immoral, they rebel, because they do not like to be told they are interested in an institution which is not a moral one. When you enter into a defense of slavery, they seize upon it, for they like justification. The result is, that public opinion is formed among them which insists upon the encouragement or protection, the enlargement or perpetuation of slavery – and secures them property in the slave. Now this comes in conflict with this proposition that we at the North view slavery as a wrong. We understand that the ‘equality of man’ principle which actuated our forefathers in the establishment of the government is right; and that slavery, being directly opposed to this, is morally wrong. I think that if anything can be proved by natural theology, it is that slavery is morally wrong. God gave man a mouth to receive bread, hands to feed it, and his hand has a right to carry bread to his mouth without controversy. The Hartford Courant reported the next day: “The speech of Mr. Lincoln at the City Hall, last night, was the most convincing and clearest speech we ever heard made. He carried the judgement, the conscience and the good will of audience right straight along, from the beginning to end. Connecticut journalist Daniel Bidwell testified that Mr. Lincoln’s “Gaunt, homely figure, unpretending manner, conversational air, careless clothing and dry humor made him at once a favorite with the audience, who felt that he was indeed a man of the people.” 12 When the speech was over, the newly-formed Wideawakes with their capes, caps, torches and the Hartford Cornet Band escorted the speaker to his hotel, where a reception was held for him. The good opinion of the Hartford editor was to play an important part in the lives of both Mr. Lincoln and Welles. Like Mr. Lincoln, Welles took an early and precocious role in politics – except unlike Mr. Lincoln, he did so on the side of Andrew Jackson. Welles was elected to the State Assembly from Glastonbury and became a conduit for political patronage for the Democratic Party for years. He helped place his newspaper’s editor in the post of Hartford postmaster, nixing a political opponent of Welles. Welles then succeeded his boss as editor of the Hartford Times. He later coveted the post office position for himself and in order to get it, arranged to have his former boss elected to the U.S. Senate so that Andrew Jackson would appoint him to the postmaster job which Welles held for five years. In the 1840s, he served under President Polk as chief of the Bureau of Provisions and Clothing in the Navy Department. As a Democrat, Welles served as state comptroller, but in the mid-1850s he switched to the new Republican Party and became the party’s sacrificial candidate for governor of Connecticut in 1856. By 1860, he was the state’s Republican national committeeman. As usual, a local band accompanied Mr. Lincoln home – in this case the home of James F. Babcock, the editor of the New Haven Palladium, where hundreds of noisy residents encouraged the Illinois speaker to talk some more. According to Gideon Welles biographer John Niven, “Babcock knew of Welles’ antipathy toward Seward…The New Haven editor may well have told his house guest that Welles was for Chase but that the delegation [to the Republican National Convention] was uncommitted.”19 Like Mr. Lincoln, Babcock was a former Whig turned Republican. That night Mr. Lincoln took the train north to Meriden where he spoke at Town Hall on East Main Street before an enthusiastic audience of 3,000. “A torch-light procession escorted Lincoln to the great town hall, where he spoke to an audience that literally packed the building,” reported Eggleston. 21 According to Nelson Burr: “The meeting ended with ‘tremendous’ cheers for him, for Buckingham and the state ticket, the Republican cause, and the delegation from New Haven.”22 Mr. Lincoln then returned that night back to New Haven by the same special train. It was after midnight until he reached the Babcock residence. Again, there was a band to march Mr. Lincoln home – this one from Wallingford. Mr. Lincoln stayed overnight at the Wauregan Hotel on Main Street and took a train early Saturday morning, March 10, from Norwich to Bridgeport. Arriving in late morning, he apparently spent much of the day in conversation at the home of Charles F. Wood on Washington Avenue. It was another capacity crowd that night for the last speech he would ever give in New England. He spoke at Washington Hall, the city’s largest venue, located within the City Hall on State Street, but no record of his comments is known. After his speech, Mr. Lincoln took a night train back to New York City, where he attended church and visited friends before leaving for home in Springfield. When the state held elections at the beginning of April, Governor Buckingham won reelection – but by just 541 votes. “It was the most desperate fight that I was ever engaged in. We met the enemy with the weapons of truth, liberty and justice, and they met our floating population as Philip of Macedon did the Greeks, with bribes in their hands,” wrote James F. Babcock to Mr. Lincoln in early April 1860. During the Civil War, Governor Buckingham returned the support Mr. Lincoln had given him in his 1860 campaign. “As early as January, 1861, Buckingham at Hartford had taken personal responsibility for purchasing knapsacks, bayonets, and other equipment for 5000 men,” wrote historian Allan Nevins. 29 In April 1861, Buckingham won a 2,000-vote victory over Democrat James C. Loomis. He vigorously turned his attention to the war effort and according to historian William B. Hesseltine: “On his own personal notes the Governor borrowed money from the state’s banks and with it purchased arms and equipment for the troops.” 30 Perhaps more gratifying to President Lincoln, Buckingham supported President Lincoln’s Emancipation Proclamation. ‘Are you Mr. Lincoln’s son,’ asked Mr. [William] Evarts of New York. ‘Yes, sir,’ replied Willie, the elder of the two. Meeting Vice President-elect Hannibal Hamlin in Chicago in late November 1860, President-elect Lincoln turned over to him responsibility for selection of a New England representative for the Cabinet. Senator Hamlin had his own prejudices against some of the New England names Mr. Lincoln raised – such as former Massachusetts Governor Nathaniel Banks. Mr. Lincoln was concerned that the appointee be willing to support enforcement of the fugitive slave law, then an important constitutional principle. Welles chose not to purse a Cabinet appointment but let others do so for him. Welles later wrote: “Learning at an early day after the election that the President had my name under consideration, I forebode all communication with him, and declined, though earnestly advised and invited, to visit him or the seat of government while the subject of the formation of the cabinet was undetermined. Soon after the arrival of the President in Washington, I received a letter from James Dixon, one of the senators from Connecticut and a resident of my own town, written by request of Mr. Lincoln, propounding certain questions to me with reference to my appointment and a few days later a letter form the Vice-President-elect, Hannibal Hamlin, informed me that the President requested me to come to Washington. This summons I promptly obeyed.” 42 Welles expected to be named postmaster general. When he finally met with the President-elect on March 4, he was named to secretary of the navy. In office, Secretary of the Navy Welles won over President Lincoln’s respect for calm, thorough efforts during the Civil War. But it was Mrs. Welles who perhaps was closest to the Lincoln family. Having lost five of her own children, she was in a strong position to comfort Mary Todd Lincoln on the death of her son Willie in February 1861. Dixon was no radical. He favored on compromise with the South in the winter of 1860-1861. In December 1860, Dixon gave a Senate speech in which he said: “My constituents are ready to make any sacrifice which a reasonable man can ask or an honorable man can grant.” 46 Dixon was, however, more realistic than Welles on the threat caused by southern secession. He later opposed to presidential emancipation in 1862. Dixon’s focus was more on politics than policy. His greed for patronage and relentless attempts to assure that as little as possible went to his political rivals created severe problems within the Connecticut Republican Party. He worked in direct opposition to the interests of Navy Secretary Gideon Welles and his allies – Navy Department aide William Faxon and Hartford Evening Press editor Mark Howard. Connecticut patronage problems would come to plague President Lincoln. According to artist Francis B. Carpenter, shortly after President-elect Lincolns’ arrival in Washington a Connecticut man accosted him at Willard’s Hotel where he was staying. He said “he wanted nothing but to take the incoming President by the hand. Mr. Lincoln surveyed him from head to foot, and giving him a cordial grasp, replied: ‘You are a rare man. '”47 Howard Dixon was fated to carry on their own uncivil war over Connecticut politics. Dixon showed a rare ability to muster support for his patronage choice through bluff, bluster and personal pressure on the President. Historian Allan G. Bogue noted that Dixon “was unusual…in that his colleagues believed that he had sat adjacent to the congressman from Illinois, Abraham Lincoln as a member of the House of Representatives during the 1840s, a position that now gave him, some suspected, an unfair advantage in the struggle for political patronage.” 48 Dixon went out of his way to block Mark Howard from appointment as Hartford postmaster; his own choice was appointed and drew a storm of Republican protest when he kept the local post office in a building owned by the proprietors of the city’s largest Democratic newspaper. President Lincoln’s policy was to consult with the Republican congressional delegation on appointments and Dixon pushed to get his way – especially with the appointment of tax collectors and assessors in 1862. Dixon concluded this letter: “Excuse my earnestness. How can I feel less when I know that the appointment of Mr. Chase’s list is the death of your true friends & supporters in the state, as well as my own personal disgrace and humiliation.” 50 In still a third letter the same day, Dixon wrote plaintively: “If Hammond and Holister are not appointed [as tax collectors] my humiliation and disgrace will be complete. Babcock and the Chairman of the State Committee will see you by Wednesday. I rely with hope and confidence that you will spare our cause the injury and myself the intense mortification of a rebuke from you. Will you please reply and relieve my anxiety.”51 Over Dixon’s objection Howard was appointed as a collector, but Dixon worked behind the scenes to have his appointment rejected by the Senate. In the process, he drove Howard away from the President and toward the presidential candidacy of Salmon P. Chase in 1864. Historian John Niven wrote: “The death of the United States Marshall for Connecticut, a Dixon man, in December 1863 had created a vacancy in an important post. Both the radical state faction and the conservative congressional faction put forward candidates. But Senator James Dixon moved more promptly than the radicals, and he managed to have Lincoln put his own man, Henry Hammond, in the coveted spot. The overburdened President neglected to ask Welles’ advice when he made the appointment. He had acted on the assumption that Dixon, who claimed he spoke for the entire congressional delegation, was reflecting party opinion in Connecticut.” 52 Once again, Dixon triumphed. Mr. Foster answered that he had not asked the man’s pardon but only that the sentence should be stayed till the facts might be investigated. That year, Navy Secretary Gideon Welles paid an important role in the re-nomination of President Lincoln — both at the state and national levels. The first endorsement of Mr. Lincoln for reelection came from New Hampshire where Welles and his assistant helped mobilize support among key Navy Yard personnel. In mid-February, Welles also helped organize the Lincoln effort by getting Connecticut Republicans to endorse President Lincoln’s reelection at the same time they renominated Governor Buckingham in February. Welles was helping to block the presidential candidate of the same man he himself had supported in 1860, Salmon P. Chase. Secretary Welles wrote in his diary in late February 1864: “A circular, ‘strictly private,’ signed by Senator [Samuel C.] Pomeroy and in favor of Mr. Chase for President, has been detected and published. It will be more dangerous in its recoil than its projectile. That is, it will damage Chase more than Lincoln. The effect on the two men themselves will not be serious. Both of them desire the position, which is not surprising; it certainly is not in the President, who would be gratified with an endorsement. Were I to advise Chase, it would be not to aspire for the position, especially not as a competitor with the man who has given him his confidence, and with whom he has acted in the administration of the government at a most eventful period…Chase tries to have it thought that he is indifferent and scarcely cognizant of what is doing in his behalf, but no one of his partisans is well posted as Chase himself.”63 Welles was right; the Pomeroy Circular helped destroy Chase’s candidacy. McSeveney wrote: “Connecticut Republicans, confident that they would benefit disproportionately from the vote of servicemen, expended considerably energy to secure as many such votes as possible. Nevertheless, recognizing the difficulties in securing a large military turnout, they refused to bank on the troops to achieve victory in the state…he issued specific instructions: chairmen were to report the total number of “UNION, COPPERHEAD AND DOUBTFUL voters’ in their towns; they were not to estimate the vote of soldiers, ‘except such as are already at home, or those you know will be…. '”67 Connecticut was probably the only state in which the soldier vote determined the winner and the disposition of the state’s electoral votes. Percy C. Eggleston, Lincoln in New England, pp. 14-15. Richard S. West, Gideon Welles: Lincoln’s Navy Department, p. 88. Robert S. Harper, Lincoln and the Press, p. 47. Doris Kearns Goodwin, Team of Rivals: The Political Genius of Abraham Lincoln, p. 232. John Niven, Gideon Welles: Lincoln’s Secretary of the Navy, p. 289. William B. Hesseltine, Lincoln and the War Governors, p. 25. Richard S. West, Gideon Welles: Lincoln’s Navy Department, p. 80 (Hartford Evening Press, March 6, 1860). Nelson R. Burr, Abraham Lincoln: Western Star Over Connecticut, p. 6. Roy P. Basler, editor, Collected Works of Abraham Lincoln, Speech at Hartford, Connecticut, Volume IV, pp. 2-8 (March 5, 1860 published in the Hartford Daily Courant, March 6, 1860. Another different version was published in Hartford Evening Press on the same day). Nelson R. Burr, Abraham Lincoln: Western Star Over Connecticut, p. 6 (Hartford Courant, March 6, 1860). Nelson R. Burr, Abraham Lincoln: Western Star Over Connecticut, p. 7-8. Harold Holzer, Lincoln at Cooper Union, p. 194. Richard S. West, Gideon Welles: Lincoln’s Navy Department, p. 81. Nelson R. Burr, Abraham Lincoln: Western Star Over Connecticut, p. 10. Nelson R. Burr, Abraham Lincoln: Western Star Over Connecticut, p. 11 (New Haven Pallaldium). Percy C. Eggleston, Lincoln in New England, p. 15. Nelson R. Burr, Abraham Lincoln: Western Star Over Connecticut, p. 10 (New Haven Pallaldium). Roy P. Basler, editor, Collected Works of Abraham Lincoln, Speech at New Haven, Connecticut, March 6, 1860, Volume IV, pp. 13-30. Percy C. Eggleston, Lincoln in New England, p. 16. Nelson R. Burr, Abraham Lincoln: Western Star Over Connecticut, p. 12. Percy C. Eggleston, Lincoln in New England, pp. 19-21. Nelson R. Burr, Abraham Lincoln: Western Star Over Connecticut, March 10, 1860, p. 13. Percy C. Eggleston, Lincoln in New England, p. 23. Francis B. Carpenter, The Inner Life of Abraham Lincoln: Six Months at the White House, pp. 309-310. Nelson R. Burr, Abraham Lincoln: Western Star Over Connecticut, p. 14. Allan Nevins, The War for the Union: The Improved War, 1861-1862, p. 346. William B. Hesseltine, Lincoln and the War Governors, p. 169. Roy P. Basler, editor, Collected Works of Abraham Lincoln, Volume VI, p. 54. (Letter from Abraham Lincoln to William A. Buckingham, January 12, 1863). Frederick Douglass, Life and Times of Frederick Douglass, pp. 348-350. William E. Baringer, Lincoln’s Rise to Power, p. 195. John Niven, Gideon Welles: Lincoln’s Secretary of the Navy, p. 300. Nelson R. Burr, Abraham Lincoln: Western Star Over Connecticut, p. 20. Richard S. West, Gideon Welles: Lincoln’s Navy Department, pp 85-86. Abraham Lincoln Papers at the Library of Congress. Transcribed and Annotated by the Lincoln Studies Center, Knox College. Galesburg, Illinois, (Letter from William A. Buckingham to Abraham Lincoln, May 21, 1860). Richard S. West, Gideon Welles: Lincoln’s Navy Department, p. 86. Abraham Lincoln Papers at the Library of Congress. Transcribed and Annotated by the Lincoln Studies Center, Knox College. Galesburg, Illinois, Abraham Lincoln Papers at the Library of Congress (Telegram from H.F. Sperry to Abraham Lincoln, November 8, 1860). Rufus Rockwell Wilson, editor, Intimate Memories of Lincoln, pp. 352-353. Rufus Rockwell Wilson, editor, Intimate Memories of Lincoln, pp. 359-360. Harry J. Carman and Reinhard H. Luthin, Lincoln and the Patronage, p. 17 (Letter from James Dixon to Gideon Welles, December 3, 1860) . Harry J. Carman and Reinhard H. Luthin, Lincoln and the Patronage, p. 16 (Letter from James Dixon to Lyman Trumbull, November 13, 1860). John Niven, Gideon Welles: Lincoln’s Secretary of the Navy, p. 270. W.A.Croffut and John M. Morris, The Military and Civil History of Connecticut During the War of 1861-65, p. 33. Francis B. Carpenter, The Inner Life of Abraham Lincoln: Six Months at the White House, p. 230. Allan C. Bogue, Earnest Men: Republicans of the Civil War Senate, p. 35. Abraham Lincoln Papers at the Library of Congress. Transcribed and Annotated by the Lincoln Studies Center, Knox College. Galesburg, Illinois (Letter from James Dixon to Abraham Lincoln, August 11, 1862). Abraham Lincoln Papers at the Library of Congress. Transcribed and Annotated by the Lincoln Studies Center, Knox College. Galesburg, Illinois, (Letter from James Dixon to Abraham Lincoln, August 11, 1862). John Niven, Gideon Welles: Lincoln’s Secretary of the Navy, p. 480. Michael Burlingame, editor, An Oral History of Abraham Lincoln, John G. Nicolay’s Interviews and Essays, pp. 53-54 (John G. Nicolay conversation with Lafayette Foster, October 23, 1878). Michael Burlingame, editor, An Oral History of Abraham Lincoln, John G. Nicolay’s Interviews and Essays, p. 53 (John G. Nicolay conversation with Lafayette Foster, October 23, 1878). John Niven, Gideon Welles: Lincoln’s Secretary of the Navy, p. 524. Nelson R. Burr, Abraham Lincoln: Western Star Over Connecticut, p. 77. Charles Dana, Recollections of the Civil War, pp. 175. George W. Julian, Political Recollections, 1840 to 1862, p. 363. Francis B. Carpenter, The Inner Life of Abraham Lincoln: Six Months at the White House, p. 220. Don E. and Virginia Fehrenbacher, editors, Recollected Words of Abraham Lincoln, p. 137.
www.scils.rutgers.edu/keyrus/553doc4.html, Letter from Nehemiah D. Sperry to John G. Nicolay, February 10, 1864, www.scils.rutgers.edu/keyrus/553doc4.html. Gideon Welles, Diary of Gideon Welles, Volume I, p. 529 (February 22, 1864. Gideon Welles, Diary of Gideon Welles, Volume I, p. 529-530 (February 22, 1864. Abraham Lincoln Papers at the Library of Congress. Transcribed and Annotated by the Lincoln Studies Center, Knox College. Galesburg, Illinois (Letter from James F. Babcock to Abraham Lincoln, February 22, 1864). Samuel T. McSeveney, “Re-electing Lincoln: The Union Party Campaign and the Military Vote in Connecticut,” Civil War History, June 1986, p. 151. Samuel T. McSeveney, “Re-electing Lincoln: The Union Party Campaign and the Military Vote in Connecticut,” Civil War History, June 1986, p. 153. Abraham Lincoln Papers at the Library of Congress. Transcribed and Annotated by the Lincoln Studies Center, Knox College. Galesburg, Illinois, (Letter from James F. Babcock to Abraham Lincoln, February 22, 1864). Gideon Welles, Diary of Gideon Welles, Volume II, p. 290 (April 15, 1865).